FORMULA 1's governing body the FIA claims the chequered flag mix-up at the Canadian GP was a result of simple miscommunication, but insists it will "review procedures" for future races. The flag, which marks the end of the grand prix, was waved a lap too early on Lap 69 - though fortunately race leader Sebastian Vettel realised the error and carried on at full pace to take victory. The mistake also meant the race was officially declared as 68 laps long with the final two laps erased, and the FIA has sought to explain the incident. "It was a miscommunication between the start platform and the guy they call the starter here," said FIA race director Charlie Whiting, via Reuters. "He thought it was the last lap and asked them at the top to confirm it, they confirmed it. They thought he was making a statement when in fact he was asking a question." 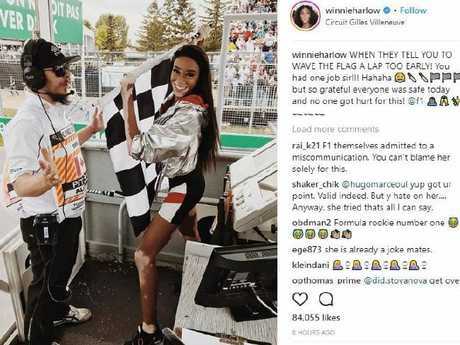 Although the flag was unfurled prematurely by model Winnie Harlow - a friend of Lewis Hamilton - Whiting insisted she was not at fault. "He told the flag waver to wave it a lap early. It was as simple as that, it wasn't anything to do with the fact it was a celebrity flag-waver," he explained. "The celebrity was not to blame." Winnie Harlow was caught in a storm. The race result wasn't affected by the early flag and erased final laps, with no changes of position taking place, but did see Max Verstappen take the fastest lap of the race rather than Red Bull teammate Daniel Ricciardo. And the error resulted in confusion for drivers, teams and marshals. Vettel double checked his lap count before confirming there was still a lap remaining with his Ferrari team, while there was a safety concern as course workers stood alongside the track to congratulate the drivers as they were still racing. "We need to review procedures and make sure we have a very simple procedure for every circuit," added Whiting. "We're dealing with different human beings, different countries, different languages and it's not always absolutely perfect. Of course we strive for perfection but fortunately, there was no harm done as far as it affected the result." The same issue occurred at the 2014 Chinese Grand Prix, while Brazilian football legend Pele famously waved the flag too late for Michael Schumacher's 2002 victory at Interlagos. Mercedes has been off the pace the past two races. Lewis Hamilton accepts Mercedes have "fallen back" in F1's pecking order over the last month but retains absolute faith that their 2018 car can take him to a fifth world title. 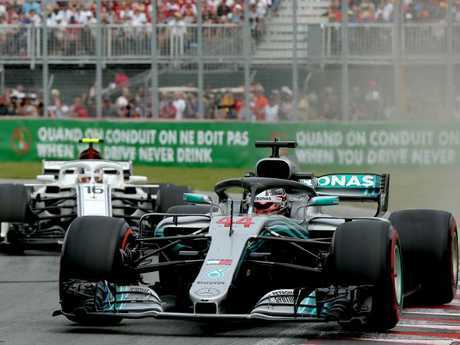 The Englishman relinquished the lead of the drivers' championship to Sebastian Vettel on Sunday after the Ferrari driver's comfortable victory in the Canadian GP, on a day Hamilton finished only fifth. While ultimately grateful to finish at all after cooling problems afflicted his car's engine, Hamilton is aware of the ground Mercedes have lost in the two races since dominating the Spanish GP in mid-May. "I'm sure the next couple of days it will get more and more painful because ultimately it was a poor weekend, but it could be a lot worse. I could have had a DNF and lost 25 points," he said. "However, in the two races we have lost 18 points so we have definitely fallen behind a little bit in that respect." That 18-point swing between Hamilton and Vettel since Barcelona means the Mercedes driver now trails his Ferrari rival by one point with a third of the 21-race season completed. But asked whether he was beginning to have any doubts about whether Mercedes' W09 car was capable of taking him to another world title, Hamilton said: "I don't let that get into my mind. That would be the first sign of weakness and my mind is not weak. I'm still here to win and still believe that we can. Hamilton is confident of a revival. "I've got complete confidence in my guys and I'm putting that energy towards them. You imagine in tennis if you look across the net and you think, 'I might lose this,' you've already lost. It doesn't matter where I start on the grid, I don't look at any driver and say, 'I might lose to that person.' I think, 'How can I beat them? How can I be better?' I am going to keep doing that." 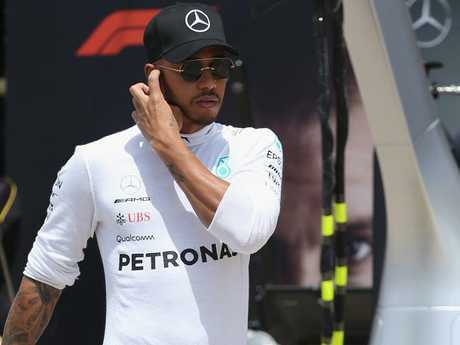 Yet, amid a season in which the balance of power at the front between the top three teams has ebbed and flowed on almost a race-to-race basis, Hamilton remains convinced Mercedes have it in their power to emerge on top again. "I think we've got potential in this car and when you guys are writing your stories, I think last year there was, 'Oh, Mercedes have the best car' and all those different things, but ultimately I think we did the better job," he added. "You probably shouldn't be writing that right now because we're not always outperforming the others, but also it's very close. "The Red Bulls are every now and then are in the mix, Ferrari have been, I would say, the most consistent, but there are a lot of races to come. "These engines have to go a long way, that's going to make things happen and that's why I'm really grateful for this one."